On 29 January 2017, more than five years since the Kazakhstan`s former capital Almaty was elected for the biennial youth world sports event by the International University Sports Federation (FISU), the President of Republic of Kazakhstan, Nursultan Nazabayev, declared the 28th World winter Universiade open. 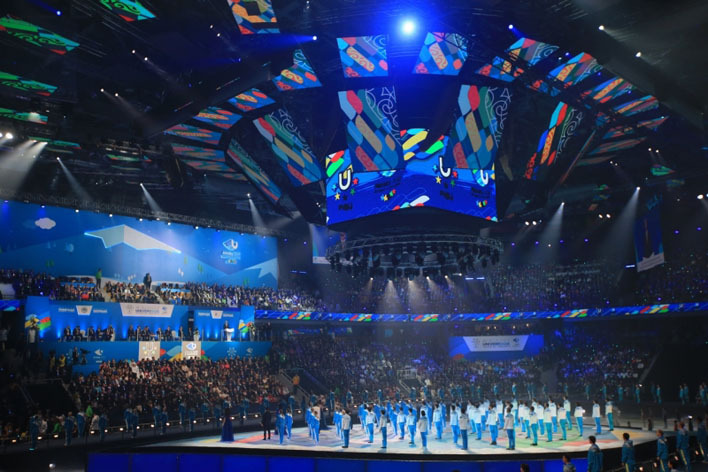 The 3-hours opening ceremony was held in a 12,000 – capacity newly built “Almaty Arena”. During a spectacular theatrical historical and ethnic show the most important glimpses of development of Kazakhstan were shown. This included country’s cultural diversity, richness of traditions, crafts and spirit of tolerance among all 125 nations living now in Kazakhstan. Delegations of 57 States took part in the Parade of Nations. Aiza Imanbekova (Kazakh skater) gave the Universiade Oath on behalf of all athletes declaring they would compete honestly. 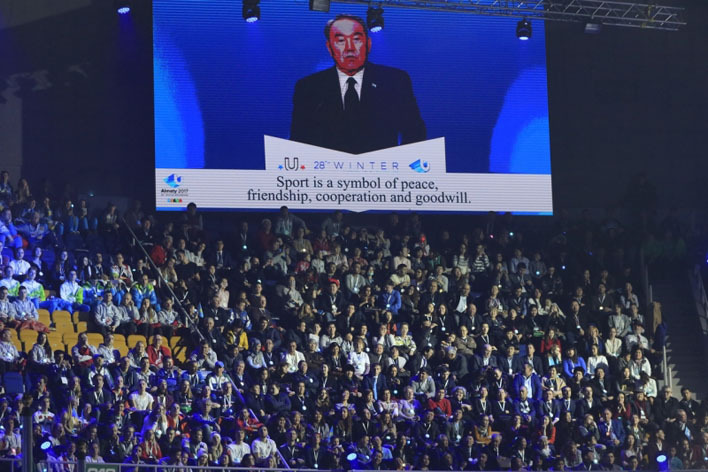 President Nazarbayev stated in his speech that through sport, culture and science Kazakhstan aims to communicate its own formula of tolerant development. He stressed that preparation for the Universiade made Kazakhstan people stronger and more united and helped to transform the image of Almaty. For the first time in the history of Winter Universiades, an Athlete’s Village was specially built. Later it will be transformed into a new living district with social housing for 1,700 families. The President concluded his speech with the words by physiologist Angelo Mosso: “Sport can replace many medicines, but no pill in the world can replace sport”. At the end of the ceremony, 16 torchbearers from major Kazakh cities burned the Universiade flame. The Universiade will last from 29 January to 8 February 2017. During these 10 days 2200 athletes from all over the world will compete for 543 medals in 12 types of winter sports, including alpine skiing, short track, figure skating, snowboarding, biathlon, ice hockey, cross country skiing, curling, speed skating, freestyle, ski jumping and Nordic combined. The Universiade will be broadcasted to 80 countries through 43 TV channels.